Kennedy and Khrushchev ultimately saved the world from a nuclear cataclysm. It was not a triumph of pure American will, as some devoted to U.S. maximalism like to forget, but the result of a negotiated arrangement. Fidel Castro wrote these words in 1958, the decisive year of his guerrilla war against Dictator Fulgencio Batista. Mario was a peasant from Cuba’s Sierra Maestra mountain range whose house was bombarded by the regime’s U.S.-equipped air force. Although Fidel Castro had expressed an adolescent admiration for President Franklin Delano Roosevelt, by 1958, he was acutely aware that a clash with Washington was probable if not inevitable. In Latin America, Washington’s support for dictators such as Batista was the norm, not the exception. No matter how terrible they were to their people, dictators were considered a safeguard against communist penetration in the hemisphere. Following this logic, not only communism, but most types of nationalism were considered anathema to Ike Eisenhower’s Washington. By March 1960, President Eisenhower saw Castro as a real challenge to U.S. hegemony in the Western Hemisphere and ordered the CIA to start training Cuban exiles and supporting anti-Castro groups in the mountains of central Cuba. A few days before John Kennedy became president, the United States broke diplomatic relations with Cuba. The CIA was already training a Cuban exile military force in Guatemala. In spite of some of his most brilliant political advisers’ opposition to the military course (Arthur Schlesinger favored a coordinated international effort to put pressure on Castro in favor of democratic elections in Cuba regardless of Castro’s popular appeal), Kennedy allowed the CIA to go ahead. In less than 72 hours, Fidel Castro and his followers had defeated the U.S.-trained force. By the end of 1961, Castro’s only choice was to prepare for a fight against an invasion by American troops. Fidel convinced Nikita Khrushchev of the necessity to commit Soviet troops in the defense of Cuban territory. Khrushchev doubled down on Castro’s petition and proposed the installation of nuclear missiles in Cuba as a way to change the global nuclear balance and prevent any U.S. military “adventure” against Cuba. American hubris was matched by Russian arrogance. Instead of heeding Raul Castro’s objection to a secret nuclear buildup on the island, the Soviets insisted on installing the missiles and announcing it later as a fait accompli, offering false guarantees to President Kennedy that “offensive” weapons would never be installed on the island. Kennedy declared that the United States would not tolerate any action of this kind in the Western Hemisphere. When the United States discovered the weapons, the nature of the conflict changed. From aggressor against a smaller neighbor, the United States became the victim of a Soviet plan to install nuclear weapons only 90 miles from its shores in secrecy. Confronted with this reality, Kennedy was forced to choose between appeasement and resisting the menace. As the noted Yale historian Donald Kagan has argued, reputation and honor have a place in the calculations of national power. More than a change in the military balance, the United States was facing a challenge to its commitment to defending its allies in the Western Hemisphere and Europe. The crisis of the missiles in Cuba was a test of the United States’ resolve to face all risks and stand against Soviet adventurism. Castro’s rational calculation against a course of appeasement towards Washington’s aggressive behavior is probably the most underestimated factor of his behavior during the crisis. Even scholars as prestigious as James Blight appeared in a video psychoanalyzing Fidel and presenting his attitude as a simplistic continuation of a children’s game of crashing bikes against a wall that he is said to have played in his high school years. 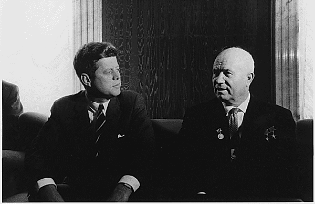 Kennedy and Khrushchev ultimately saved the world from a nuclear cataclysm. It was not a triumph of pure American will, as some devoted to U.S. maximalism like to forget, but the result of a negotiated arrangement. Kennedy preserved the unity of the Atlantic Alliance and the prestige of the United States while containing the military threat. The Soviets removed their nuclear weapons from Cuba, and the United States committed itself not to invade Cuba and offered a gentlemen’s agreement to later remove its Jupiter missiles from Turkey and Italy. Berlin was preserved. The crisis marked a watershed in the Cold War. Détente and engagement appeared as fresh ways to avoid appeasement as well as confrontation. Kennedy’s subsequent speech at an American University, the establishment of the U.S.-Soviet hotline, and the relaxation of tensions in Berlin were a demonstration that real leadership was taking world politics to a safer stage. Yet 50 years since the missile crisis, the Cold War between the United States and Cuba remains unfinished. Fidel Castro is a retired head of State. Cuba is immersed in significant economic reforms and is taking steps towards a political liberalization of its one-party system. But although the Obama administration has taken some minimal steps toward engagement, the necessary presidential leadership has been absent from the Cuban issue. It was Obama who once advocated a policy of dialogue with Raul Castro and other adversaries not as appeasement but as a proper tool to promote American interests in the world. Although the president has largely backed away from this policy, nothing positive can be expected from Mitt Romney, whose policy towards Cuba consists largely of kowtowing to the property claims and narrow interests of a hard right-wing segment of the Cuban exile community. If blessed with a second term, President Obama should pay attention to Ted Sorensen’s assessment of Kennedy’s long view about Cuba: “Kennedy opposed Communism in the Western Hemisphere, but he was not obsessed with hatred for Castro personally. Gradually, he acquired a grudging respect for Castro, in whom he discerned remarkable qualities of leadership. He and Castro, despite the ideological gulf between them, would no doubt someday have enjoyed a personal dialogue, in which private mutual admiration might well have played a part.” There is evidence that Kennedy began to explore an accommodation of Cuban nationalism if the Cuban regime was willing not to ally with U.S. enemies elsewhere. Arturo Lopez-Levy is a research associate and a doctoral candidate at the Josef Korbel School of International Studies of the University of Denver. He is Cuban-American and writes frequently about Cuban issues and U.S.-Cuba relations.